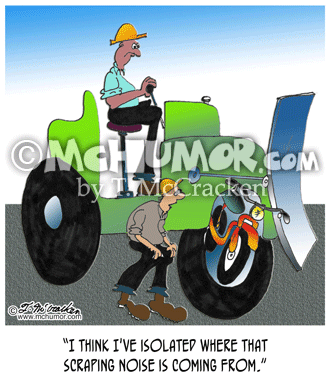 Bulldozer Cartoon 6176: A mechanic seeing a motorcycle under a huge bulldozer fender saying, "I think I've isolated where that scraping noise is coming from." 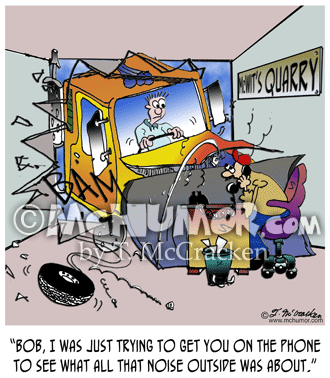 Bulldozer Cartoon 8245: When bulldozer crashes through a quarry's office walls a man on the phone says, "Bob, I was just trying to get you on the phone to see what all that noise outside was about." 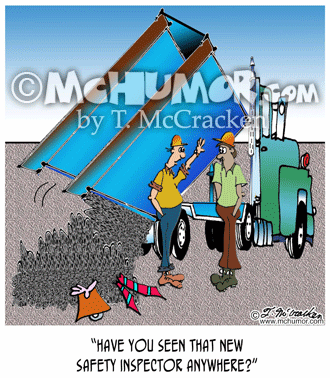 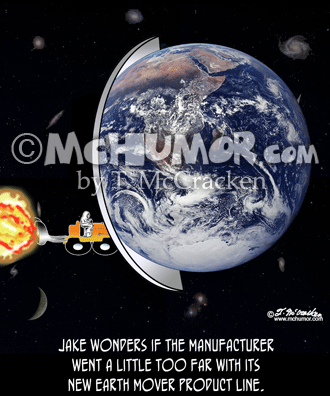 Safety Cartoon 8153: Not seeing a tie hanging out of a pile of gravel he just dropped a dump truck driver asks, "Have you seen that new safety inspector anywhere lately?" 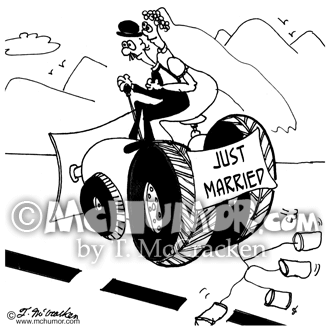 Bulldozer Cartoon 6329: Tin cans are tied behind a bulldozer with a "Just Married" sign on it. 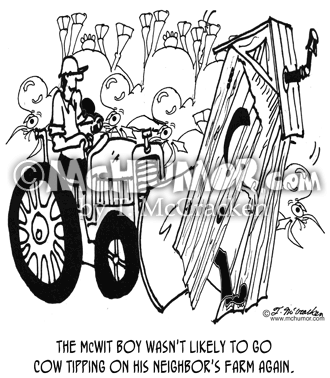 A Outhouse Cartoon 5954: "The McWit boy wasn't likely to go cow tipping on his neighbor's farm again." 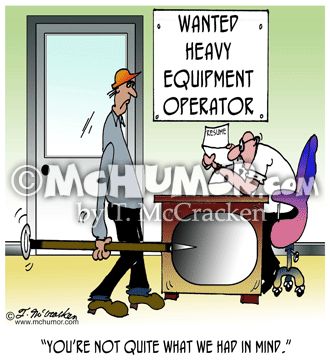 A bulldozer knocks over an outhouse with someone inside it. 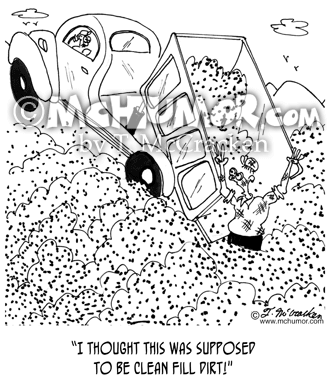 Excavation Cartoon 6435: A man in a mud pile behind a dump truck says, "I thought this was supposed to be clean fill dirt!" 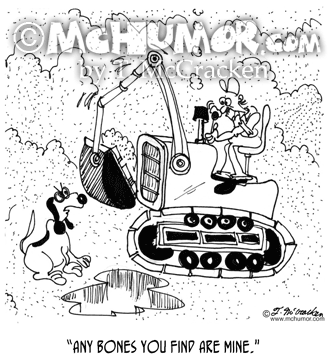 Dog Cartoon 6375: A dog says to a man digging a bulldozer, "Any bones you find are mine." 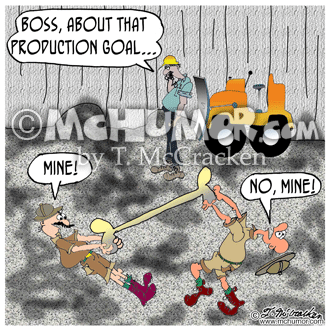 Quarry Cartoon 8424: As two paleontologists fight over a dinosaur bone in a quarry a driver by an idle bulldozer says on the phone, "Boss, about that production goal ... "